A macular hole is a defect of the foveal retina involving its full thickness from the internal limiting membrane (ILM) to the outer segment of the photoreceptor layer. Full-thickness macular hole showing a surrounding cuff of subretinal fluid. A macular hole was first described by Knapp in 1869 in a patient who sustained blunt trauma to the eye. Subsequent case reports and series pointed to antecedent episodes of ocular trauma such that the two were customarily linked to each other. However, throughout this century, ophthalmologists increasingly have recognized that this condition more commonly occurs in atraumatic settings and have differentiated these macular holes from trauma-induced holes by describing them as idiopathic full-thickness macular holes. In fact, case series as far back as the 1970s reported that more than 80% of macular holes are idiopathic and that only less than 10% have associated history of trauma to the eye. The causes underlying trauma-related macular holes and idiopathic macular holes are understandably divergent. Trauma-related macular holes are suspected to be related to the transmission of concussive force in a contrecoup manner, which results in the immediate rupture of the macula at its thinnest point. Patients who underwent successful repair of a rhegmatogenous retinal detachment were also found to infrequently develop macular holes (< 1% incidence). The underlying pathophysiology for formation of these holes is not well understood, though epiretinal membrane formation, foveal photoreceptor atrophy, and hydraulic forces may play a role. While the vitreous was suspected to be involved in the causation of idiopathic macular holes by Lister in 1924, Johnson and Gass, in 1988, first described a classification system that focused on anteroposterior and tangential vitreous traction on the fovea as a primary underlying cause for idiopathic macular holes. [1, 2] Shrinkage of prefoveal cortical vitreous with persistent adherence of vitreous to the foveal region results in the causative traction. Gass macular hole stages are described below. Stage 1a (foveal detachment; macular cyst): Tangential vitreous traction results in the elevation of the fovea marked by increased clinical prominence of xanthophyll pigment. This stage is occasionally referred to as the yellow dot stage and can also be seen in cases of central serous chorioretinopathy, cystoid macular edema, and solar retinopathy as depicted below. 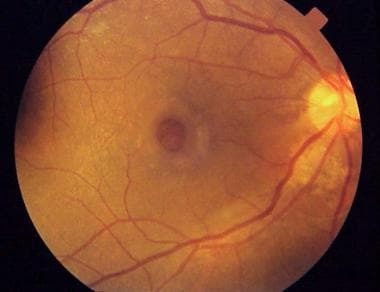 Fundus photograph of a stage 1a macular hole with characteristic yellow spot at the center of the fovea. Stage 1b: As the foveal retina elevates to the level of the perifoveal, the yellow dot of xanthophyll pigment changes to a donut shaped yellow ring. Persistent traction on the fovea leads to dehiscence of deeper retinal layers at the umbo. Stage 2: This is the first stage when a full-thickness break in the retina exists. It is defined as a full-thickness macular hole less than 400 µm in size. The full-thickness defect may appear eccentric, and there may be a pseudo-operculum at this stage if there has been spontaneous vitreofoveolar separation. These opercula have been examined and found to be vitreous condensation and glial proliferation without harboring any retinal tissue. Stage 3: A full-thickness macular hole in the retina exists. It is greater than 400 µm in size and is still with partial vitreomacular adhesion/traction. Stage 4: A full-thickness macular hole exists in the presence of a complete separation of the vitreous from the macula and the optic disc. There is evidence, however, that, even in the presence of an apparent posterior vitreous detachment, a thin shell of residual cortical vitreous may still remain and contribute to the macular hole. Visual dysfunction in patients with macular hole is directly related to the absence of retinal tissue in the fovea. 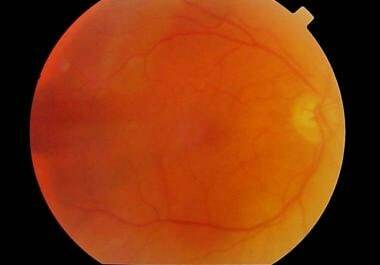 However, visual dysfunction may seem out of proportion to the size of the macular hole and potentially may also be related to the presence of a cuff of subretinal fluid with associated photoreceptor atrophy. The overall prevalence is approximately 3.3 cases in 1000 in those persons older than 55 years. Peak incidence of idiopathic macular hole development is in the seventh decade of life, and women typically are affected more than men. Reasons for this, at best, are speculative at this point. Some epidemiologic risk factors, such as cardiovascular disease, hypertension, and a history of hysterectomy, have been reported by other studies. However, none of these have been proven to have any significant association with macular hole formation. The prevalence rate of macular hole in India is a reported 0.17%, with a mean age of 67 years. The Beijing Eye Study found the rate of macular holes to be 1.6 out of 1000 elderly Chinese, with a strong female predilection. The natural history of a macular hole varies based on its current clinical stage. It has been reported that around 50% of stage 0 and stage 1 macular holes may resolve both in the anatomic changes and the symptoms produced. Stage 2 holes progress and worsen in most cases to stage 3 or stage 4, resulting in worsening vision. Best estimates for the incidence of development of an idiopathic full-thickness macular hole in the fellow eye are approximately 12%. In rare instances (0-10%), a full-thickness macular hole may spontaneously close with resultant good vision. There is no racial predilection reported, though prevalence rates for the epidemiologic studies in India and China are consistent with reported data. Women typically are affected more than men. Peak incidence is in the seventh decade of life. Multiple other studies cite similar success rates, though vision recovery may be protracted and also further delayed by onset of cataract formation. Use of ILM peeling may further increase the rate of single operation success, though it may potentially slow or affect final vision recovery. See Controversies surrounding the surgical repair of macular holes. Development of a normal photoreceptor inner segment and outer segment junction, which can occur as early as 1 month postoperatively but typically by 6 months postoperatively as shown in the images below. 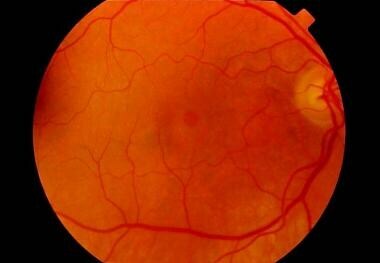 Preoperative fundus photograph of a macular hole. Fundus photograph of the same patient as in the image above at 6 months postoperatively. Note the increased media opacity caused by cataractous changes of the lens. While surgery for macular holes is considered elective, it is important for the patient to consider prognostically that there is potentially a risk for the fellow eye to develop a macular hole as well (12%). Older individuals should be educated on the necessity of a yearly eye examination since early symptoms of a macular hole can easily go undetected by the patient. Lister W. Holes in the retina and their clinical significance. Br J Ophthalmol. 1924. 8:1-20. Johnson RN, Gass JD. Idiopathic macular holes. Observations, stages of formation, and implications for surgical intervention. Ophthalmology. 1988 Jul. 95(7):917-24. [Medline]. Steel DH, Lotery AJ. Idiopathic vitreomacular traction and macular hole: a comprehensive review of pathophysiology, diagnosis, and treatment. Eye (Lond). 2013 Oct. 27 Suppl 1:S1-21. [Medline]. Wendel RT, Patel AC, Kelly NE. Chapter 120: Macular Hole Surgery. Guyer DR, Yannuzzi LA, Chang S, Shields JA, Green WR, eds. Retina-Vitreous-Macula. Philadelphia: WB Saunders Co; 1999. Vol 2: 1432-1448. Tanaka Y, Shimada N, Moriyama M, Hayashi K, Yoshida T, Tokoro T, et al. Natural history of lamellar macular holes in highly myopic eyes. Am J Ophthalmol. 2011 Jul. 152(1):96-99.e1. [Medline]. Ciardella AP, Lee GC, Langton K, Sparrow J, Chang S. Autofluorescence as a novel approach to diagnosing macular holes. Am J Ophthalmol. 2004 May. 137 (5):956-9. [Medline]. Stalmans P, Benz MS, Gandorfer A, Kampik A, Girach A, Pakola S, et al. Enzymatic vitreolysis with ocriplasmin for vitreomacular traction and macular holes. N Engl J Med. 2012 Aug 16. 367(7):606-15. [Medline]. Muqit MMK, Hamilton R, Ho J, Tucker S, Buck H. Intravitreal ocriplasmin for the treatment of vitreomacular traction and macular hole- A study of efficacy and safety based on NICE guidance. PLoS One. 2018. 13 (5):e0197072. [Medline]. Chaudhary K, Mak MY, Gizicki R, Muni RH, Wong DT, Altomare F, et al. PROPORTION OF PATIENTS WITH MACULAR HOLE SURGERY WHO WOULD HAVE BEEN FAVORABLE OCRIPLASMIN CANDIDATES: A Retrospective Analysis. Retina. 2017 Jan. 37 (1):76-79. [Medline]. Feng HL, Roth DB, Hasan A, Fine HF, Wheatley HM, Prenner JL, et al. INTRAVITREAL OCRIPLASMIN IN CLINICAL PRACTICE: Predictors of Success, Visual Outcomes, and Complications. Retina. 2018 Jan. 38 (1):128-136. [Medline]. Schumann RG, Langer J, Compera D, Luedtke K, Schaumberger MM, Kreutzer T, et al. Assessment of intravitreal ocriplasmin treatment for vitreomacular traction in clinical practice. Graefes Arch Clin Exp Ophthalmol. 2017 Nov. 255 (11):2081-2089. [Medline]. Gonvers M, Machemer R. A new approach to treating retinal detachment with macular hole. Am J Ophthalmol. 1982 Oct. 94(4):468-72. [Medline]. Kelly NE, Wendel RT. Vitreous surgery for idiopathic macular holes. Results of a pilot study. Arch Ophthalmol. 1991 May. 109(5):654-9. [Medline]. Rahimy E, McCannel CA. IMPACT OF INTERNAL LIMITING MEMBRANE PEELING ON MACULAR HOLE REOPENING: A Systematic Review and Meta-Analysis. Retina. 2016 Apr. 36 (4):679-87. [Medline]. Michalewska Z, Michalewski J, Adelman RA, Nawrocki J. Inverted internal limiting membrane flap technique for large macular holes. Ophthalmology. 2010 Oct. 117 (10):2018-25. [Medline]. Narayanan R, Singh SR, Taylor S, Berrocal MH, Chhablani J, Tyagi M, et al. SURGICAL OUTCOMES AFTER INVERTED INTERNAL LIMITING MEMBRANE FLAP VERSUS CONVENTIONAL PEELING FOR VERY LARGE MACULAR HOLES. Retina. 2018 Apr 23. [Medline]. Ch'ng SW, Patton N, Ahmed M, Ivanova T, Baumann C, Charles S, et al. The Manchester Large Macular Hole Study: Is it time to reclassify large macular holes?. Am J Ophthalmol. 2018 Jul 30. [Medline]. Kannan NB, Kohli P, Parida H, Adenuga OO, Ramasamy K. Comparative study of inverted internal limiting membrane (ILM) flap and ILM peeling technique in large macular holes: a randomized-control trial. BMC Ophthalmol. 2018 Jul 20. 18 (1):177. [Medline]. Rizzo S, Tartaro R, Barca F, Caporossi T, Bacherini D, Giansanti F. INTERNAL LIMITING MEMBRANE PEELING VERSUS INVERTED FLAP TECHNIQUE FOR TREATMENT OF FULL-THICKNESS MACULAR HOLES: A COMPARATIVE STUDY IN A LARGE SERIES OF PATIENTS. Retina. 2018 Sep. 38 Suppl 1:S73-S78. [Medline]. Tafoya ME, Lambert HM, Vu L, et al. Visual outcomes of silicone oil versus gas tamponade for macular hole surgery. Semin Ophthalmol. 2003 Sep. 18(3):127-31. [Medline]. Lai JC, Stinnett SS, McCuen BW. Comparison of silicone oil versus gas tamponade in the treatment of idiopathic full-thickness macular hole. Ophthalmology. 2003 Jun. 110(6):1170-4. [Medline]. Spiteri Cornish K, Lois N, Scott NW, Burr J, Cook J, Boachie C, et al. Vitrectomy with Internal Limiting Membrane Peeling versus No Peeling for Idiopathic Full-Thickness Macular Hole. Ophthalmology. 2014 Mar. 121(3):649-55. [Medline]. Garretson BR, Pollack JS, Ruby AJ, et al. Vitrectomy for a symptomatic lamellar macular hole. Ophthalmology. 2008 May. 115(5):884-886.e1. [Medline]. Rubinstein A, Ang A, Patel CK. Vitrectomy without postoperative posturing for idiopathic macular holes. Clin Experiment Ophthalmol. 2007 Jul. 35(5):458-61. [Medline]. Dhawahir-Scala FE, Maino A, Saha K et al. To posture or not to posture after macular hole surgery. Retina. 2008. 28:60-5. Tranos PG, Peter NM, Nath R, et al. Macular hole surgery without prone positioning. Eye. 2007 Jun. 21(6):802-6. [Medline]. Iezzi R, Kapoor KG. No face-down positioning and broad internal limiting membrane peeling in the surgical repair of idiopathic macular holes. Ophthalmology. 2013 Oct. 120(10):1998-2003. [Medline]. Alberti M, la Cour M. NONSUPINE POSITIONING IN MACULAR HOLE SURGERY: A Noninferiority Randomized Clinical Trial. Retina. 2016 Apr 4. [Medline]. Alberti M, la Cour M. Face-down positioning versus non-supine positioning in macular hole surgery. Br J Ophthalmol. 2015 Feb. 99 (2):236-9. [Medline]. Essex RW, Kingston ZS, Moreno-Betancur M, Shadbolt B, Hunyor AP, Campbell WG, et al. The Effect of Postoperative Face-Down Positioning and of Long- versus Short-Acting Gas in Macular Hole Surgery: Results of a Registry-Based Study. Ophthalmology. 2016 Feb 23. [Medline]. Morizane Y, Shiraga F, Kimura S, Hosokawa M, Shiode Y, Kawata T. Autologous transplantation of the internal limiting membrane for refractory macular holes. Am J Ophthalmol. 2014 Apr. 157(4):861-869.e1. [Medline]. Chung SE, Kim KH, Kang SW. Retinal breaks associated with the induction of posterior vitreous detachment. Am J Ophthalmol. 2009 Jun. 147(6):1012-6. [Medline]. Bhatnagar P, Kaiser PK, Smith SD, et al. Reopening of previously closed macular holes after cataract extraction. Am J Ophthalmol. 2007 Aug. 144(2):252-9. [Medline]. Singh RP, Li A, Bedi R, Srivastava S, Sears JE, Ehlers JP. Anatomical and visual outcomes following ocriplasmin treatment for symptomatic vitreomacular traction syndrome. Br J Ophthalmol. 2014 Mar. 98(3):356-60. [Medline]. Tibbetts MD, Reichel E, Witkin AJ. Vision Loss After Intravitreal Ocriplasmin: Correlation of Spectral-Domain Optical Coherence Tomography and Electroretinography. JAMA Ophthalmol. 2014 Feb 27. [Medline]. Fahim AT, Khan NW, Johnson MW. Acute Panretinal Structural and Functional Abnormalities After Intravitreous Ocriplasmin Injection. JAMA Ophthalmol. 2014 Feb 27. [Medline]. Chow N, Hong T, Chang A. Multimodal imaging of macular subretinal deposits following intravitreal ocriplasmin injection. Am J Ophthalmol Case Rep. 2018 Mar. 9:80-84. [Medline]. Al-Abdulla NA, Thompson JT, Sjaarda RN. Results of macular hole surgery with and without epiretinal dissection or internal limiting membrane removal. Ophthalmology. 2004 Jan. 111(1):142-9. [Medline]. Baba T, Yamamoto S, Arai M, et al. Correlation of visual recovery and presence of photoreceptor inner/outer segment junction in optical coherence images after successful macular hole repair. Retina. 2008 Mar. 28(3):453-8. [Medline]. Benzerroug M, Genevois O, Siahmed K, et al. Results of surgery on macular holes that develop after rhegmatogenous retinal detachment. Br J Ophthalmol. 2008 Feb. 92(2):217-9. [Medline]. Boldt HC, Munden PM, Folk JC, et al. 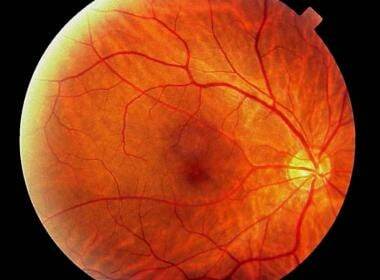 Visual field defects after macular hole surgery. Am J Ophthalmol. 1996 Sep. 122(3):371-81. [Medline]. Chan A, Duker JS, Schuman JS, et al. Stage 0 macular holes: observations by optical coherence tomography. Ophthalmology. 2004 Nov. 111(11):2027-32. [Medline]. Cox MS, Schepens CL, Freeman HM. Retinal detachment due to ocular contusion. Arch Ophthalmol. 1966 Nov. 76(5):678-85. [Medline]. Da Mata AP, Burk SE, Foster RE, et al. Long-term follow-up of indocyanine green-assisted peeling of the retinal internal limiting membrane during vitrectomy surgery for idiopathic macular hole repair. Ophthalmology. 2004 Dec. 111(12):2246-53. [Medline]. de Bustros S. Vitrectomy for prevention of macular holes. Results of a randomized multicenter clinical trial. Vitrectomy for Prevention of Macular Hole Study Group. Ophthalmology. 1994 Jun. 101(6):1055-9; discussion 1060. [Medline]. Federman JL, Gouras P, Schubert H, et al. Macular disorders. Podos SM, Yanoff M, eds. Retina and Vitreous: Textbook of Ophthalmology. 1994. Vol 9.: 15-17. Gass JD. Idiopathic senile macular hole. Its early stages and pathogenesis. Arch Ophthalmol. 1988 May. 106(5):629-39. [Medline]. Gaucher D, Haouchine B, Tadayoni R, et al. Long-term follow-up of high myopic foveoschisis: natural course and surgical outcome. Am J Ophthalmol. 2007 Mar. 143(3):455-62. [Medline]. Guyer DR, Gragoudas ES. Idiopathic macular holes. Albert DN, Jakobiec FA, eds. Principles and Practice of Ophthalmology. 1994. 883-888. Ho AC. Macular hole. Retina Vitreous Macula. 1999. Vol 2: 217-229. Ho AC, Guyer DR, Fine SL. Macular hole. Surv Ophthalmol. 1998 Mar-Apr. 42(5):393-416. [Medline]. Judson PH, Yannuzzi LA. Macular hole. Ryan SJ, ed. Retina. 1994. Vol 2.: 1169-1185. Kusuhara S, Teraoka Escano MF, Fujii S, et al. Prediction of postoperative visual outcome based on hole configuration by optical coherence tomography in eyes with idiopathic macular holes. Am J Ophthalmol. 2004 Nov. 138(5):709-16. [Medline]. Madreperla SA, McCuen BW II. Macular Hole: Pathogenesis, Diagnosis and Treatment. 1999. Nomoto H, Shiraga F, Yamaji H, et al. Macular hole surgery with triamcinolone acetonide-assisted internal limiting membrane peeling: one-year results. Retina. 2008 Mar. 28(3):427-32. [Medline]. Park SS, Marcus DM, Duker JS, et al. Posterior segment complications after vitrectomy for macular hole. Ophthalmology. 1995 May. 102(5):775-81. [Medline]. Ruiz-Moreno JM, Staicu C, Pinero DP, et al. Optical coherence tomography predictive factors for macular hole surgery outcome. Br J Ophthalmol. 2008 May. 92(5):640-4. [Medline]. Sakuma T, Tanaka M, Inoue M, et al. Efficacy of autologous plasmin for idiopathic macular hole surgery. Eur J Ophthalmol. 2005 Nov-Dec. 15(6):787-94. [Medline]. Schumann RG, Rohleder M, Schaumberger MM, et al. Idiopathic macular holes: ultrastructural aspects of surgical failure. Retina. 2008 Feb. 28(2):340-9. [Medline]. Sen P, Bhargava A, Vijaya L, et al. Prevalence of idiopathic macular hole in adult rural and urban south Indian population. Clin Experiment Ophthalmol. 2008 Apr. 36(3):257-60. [Medline]. Sjaarda RN, Glaser BM, Thompson JT, et al. Distribution of iatrogenic retinal breaks in macular hole surgery. Ophthalmology. 1995 Sep. 102(9):1387-92. [Medline]. Thompson JT. The effect of internal limiting membrane removal and indocyanine green on the success of macular hole surgery. Trans Am Ophthalmol Soc. 2007. 105:198-205; discussion 205-6. [Medline]. Tournambe PE, Poliner LS, Grote K. Macular hole surgery without face-down positioning. A pilot study. Retina. 1997. 17:179-85. Wang S, Xu L, Jonas JB. Prevalence of full-thickness macular holes in urban and rural adult Chinese: the Beijing Eye Study. Am J Ophthalmol. 2006 Mar. 141(3):589-91. [Medline]. Welch JC. Dehydration injury as a possible cause of visual field defect after pars plana vitrectomy for macular hole. Am J Ophthalmol. 1997 Nov. 124(5):698-9. [Medline]. Wu PC, Chen YJ, Chen YH, et al. Factors associated with foveoschisis and foveal detachment without macular hole in high myopia. Eye. 2007 Dec 7. [Medline]. Wu WC, Drenser KA, Trese MT, et al. Pediatric traumatic macular hole: results of autologous plasmin enzyme-assisted vitrectomy. Am J Ophthalmol. 2007 Nov. 144(5):668-672. [Medline]. Full-thickness macular hole with typical yellowish granular deposits on the retinal pigment epithelium. Fluorescein angiogram showing a central window defect.